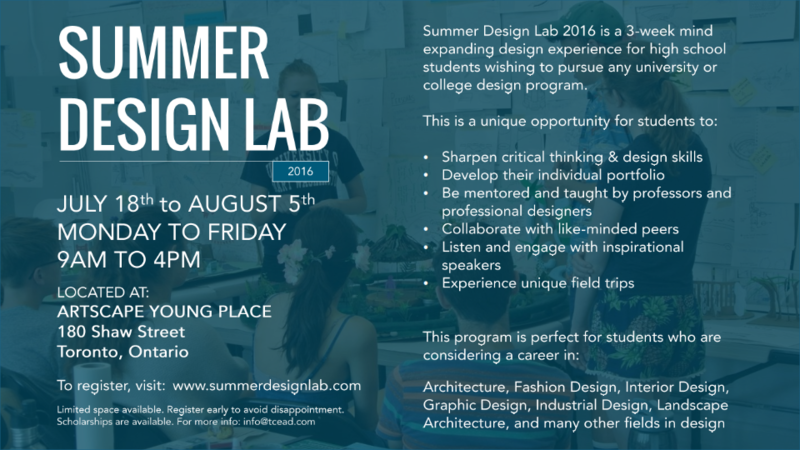 Summer Design Lab is 3-week summer intensive program that submerses students into the world of design and design thinking. This fun-filled program provides high school students (Gr 9-12) the opportunity to learn about various disciplines of design including architecture, interior design, graphic design, industrial design and other disciplines. In addition, students also have the chance to also build their portfolio of work for college in both a individual and collaborative environment. For more information: info@tcead.com or call 647-873-7303.